"Dr. Fisher is an involved communicator, who could explain complicated and abstract concepts across diverse audiences, while connecting with them at both cognitive and emotional levels. His communication style uses both physical and visual spaces at the optimum. He is very well-read on eclectic subjects and an authority on Integral theory, which he explicates with vivid personal as well as practical experience. He is a great teacher, counselor and an invaluable resource to our community that I, along with my students, have been benefitted to have." My history of teaching nearly 40 years is found below (scroll down). Yet, I want to share what is more important to me than that. 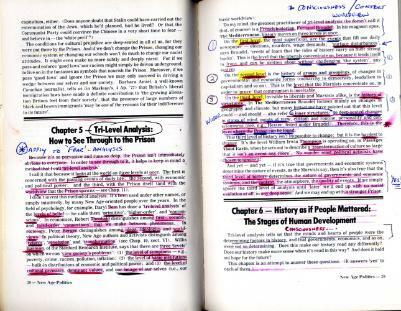 Since the late 1970s I read voraciously on books about the state of the world and I wanted to know why people were not free and why we polluted our own nest as a species. I wanted to solve that problem somewhat before I died. What I learned before I ever went to teacher's college was that great thinkers, who are not in the field of Education at all, had the most profound discoveries and guidance for me as a teacher. People like Mark Satin, who's 1978 book (New Age Politics: Healing Self and Society) is shown open to the right (not meant for you to read necessarily) but to get a feeling for how keen I was in my youth to learn about how to learn differently than we were normally taught by the authorities of our societies--and he talked of the importance of a "Tri-Level Analysis," thinking in levels to get the best picture of reality and find the best ways out of the "Prison" for our minds that many authors in those days talked about; eventually, 25 yrs later I called that prison the 'Fear' Matrix. When people have asked me what I teach, I usually pause because I teach learning more than I teach subjects they'd recognize like science, math, etc. But I'm not just interested in ways of learning either if one means just learning this way and that. Rather, like Satin's "Tri-Level" approach to analysis and thinking, there are many great thinkers, like Gregory Bateson in the late-1970s that influenced me deeply with his hierarchical model of Learning I, II, III, now called single, double and triple loop learning. 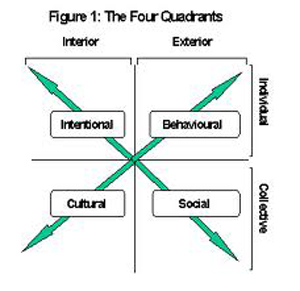 Then there are other exciting models like John Heron's and Ken Wilber's integral learning approaches (see Philosophy) or what others have called "four quadrant thinking" and "quadratic thinking" and learning, as Marilyn Atkinson teaches. These all excite me more than anything because in a sense it is like we have all the information and knowledge we need on the planet to solve our worst problems but we don't know well how to think about it (in levels) to make it really produce profound synergetic results. Like John Holt, I wanted to address "why children fail" and why adult's fail with them, to learn what they could learn in order to manifest great co-intelligence on this planet.Today I work to help organizations and individuals learn. My teaching and mentoring of young people and adults has been natural. Long before I did official teacher training (1978-80, University of Calgary), I took young people out on wildlife adventures and was a summer park naturalist in the early 1970s for two years. My love for nature was infectious and helped give many people a greater appreciation of what is in front of them they often didn't see and recognize as beautiful and amazing as part of sacred creation. After teaching a few years in public schools I realized that particular structure for learning, a rather conservative environment, was not going to nurture my growth as a teacher and I wanted more experiences. I began to teach adults art and creativity in night classes (see Art Teaching) for several years in the early 1980s, and then taught young adolescents art for several years in a treatment facility which showed me the natural way I see art processes as therapeutic (see Art Therapeutics). "I must admit that taking this course has opened my eyes to the different levels of fear that we humans operate on.... I'm glad that I have been enlightened with this knowledge.... I am not as afraid.... I feel uplifted by this class, which I never imagined would happen.... I leave here with a lighter heart." Click here for my ONLINE COURSES. For the past few years I have been a presenter of class sessions in several undergrad and grad courses, served on a doctoral research committee, mentored doctoral students and masters students, edited their academic work (see Editing), and served as a field volunteer supervisor for social work students (MSW) from the University of Southern Illinois Carbondale. My current teaching agenda and online courses (2011-) is mainly online at the Center for Spiritual Inquiry & Integral Education (particularly, at the Department of Integral & 'Fear' Studies), which I founded in 2009. I have many courses there you can check out. I'm very interested in teaching leaders in a holistic-integral way (see Consulting), as the world is in such deep crises, these kinds of individuals are going to be essential to guide the many in very demanding, if not terrifying, times ahead. I love teaching and would be glad to talk to you about any interests you'd have to bring in a facilitator and/or course developer and instructor. Rates for teaching, workshops, etc. are variable depending on your specific needs and desires. For a full teaching background see my CV. For a summary of my pedagogy of fearlessness, and critique of critical thinking as it is usually taught, in progress as the leading-edge of work I do in the field of Education, see the above journal article.